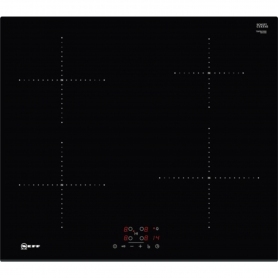 With a modern design and plenty of cooking power, the Bosch PBP6B5B60 hob is a great addition to your kitchen. Still the preferred fuel for many people, including professional chefs, gas hobs give you greater versatility and responsiveness than electric models. The Bosch PBP6B5B60 gives instant heat, allowing you to start cooking as soon as you ignite the burner. The visible flame is another advantage of gas over other fuel types. Being able to see the flame makes it much easier to tweak the temperature and means you’re less likely to burn yourself. Gas is also a cheaper fuel than electricity. The Bosch PBP6B5B60 not only gives you a great cooking experience but also saves you money. Four spacious burners offer plenty of room to cook with multiple pots and pans at the same time. The burners come in three sizes to suit various pan shapes, from large casserole dishes to single egg frying pans. Giving you even greater flexibility, the burners have three different power outputs. The economy, normal and high speed burners provide 1 kW, 1.7 kW and 3 kW of power respectively. Choosing the right burner for your dish helps you cook more efficiently. 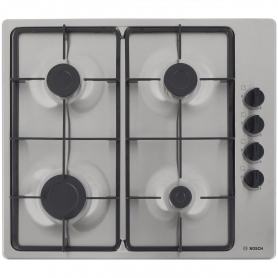 This gas hob has been made to fit seamlessly into your kitchen. The built-in design gives you the choice of where to place – whether above your oven or not. The elegant stainless steel finish adds a modern touch to the kitchen, and the two cast iron supports are both stylish and sturdy. The Bosch PBP6B5B60 model is fitted with a flame failure device which automatically shuts off the gas supply if the flame is extinguished - this will help to keep your mind at rest in case of any problems. Turn up the heat in your kitchen with the Bosch PBP6B5B60 gas hob – buy yours today.